Mickey Holliman, Mark Burleson, Dan Jones, Glen McCullough, Jr., & Mississippi State University President Mark Keenum. Twenty-four years ago, four women golfers – two of whom were cancer survivors – had a vision to start a charitable fund to help burdened cancer patients at the NMMC Cancer Center get through a devastating time in their lives. Their efforts led them to organize the first Take A Swing At Cancer Golf Tournament in 1995. 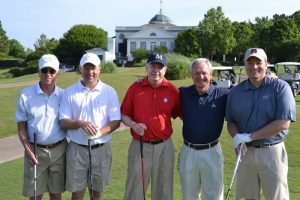 From that early beginning the Take A Swing At Cancer Golf Tournament has continued to grow and has now become an important source of charitable support for the NMMC Cancer Care Patient Fund. The NMMC Cancer Care Patient Fund provides approximately $250,000 annually to help qualifying cancer patients get much needed pain and anti-nausea medications, nutritional supplements, transportation for treatment and other supplies. This fund is often the only resource available to help patients and their families through this difficult period of their lives. 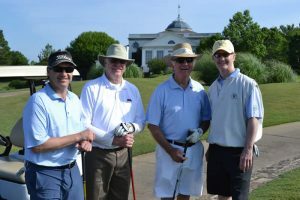 NMHS President and CEO Shane Spees played during the morning flight with Dr. Jimmy Keeton, Dr. Charles O’Mara & Dr. Mart McMullen from the University of Mississippi Medical Center. The Take A Swing At Cancer Tournament is guided by an enthusiastic group of community and regional volunteers who have a great passion for the needs of others and are willing to help organize and promote this important event. Denise Kennedy Brown Derrick Menefee, M.D. Greg Burks Charles Montgomery, M.D. (HCF) is the charitable entity for the North Mississippi Medical Center system. HCF secures and distributes donations and provides philanthropic innovation for a variety of patient- and family-centered care programs, community health improvement and patient assistance causes.